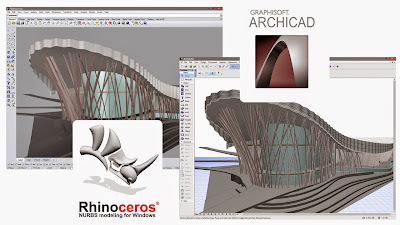 Budapest, April 30, 2015 -- GRAPHISOFT®, the leading Building Information Modeling (BIM) architectural software developer, has announced a Rhino® connection for ARCHICAD. The connection enables ARCHICAD users on both the Mac and Windows platforms to import Rhino models into ARCHICAD as GDL objects. The Rhino-ARCHICAD link converts a Rhino model into ARCHICAD geometry. The container of the Rhino-based model is GDL, which is ARCHICAD’s generic object format. For larger and complex models, GRAPHISOFT has introduced the option to convert a Rhino model into a set of smaller GDL objects. This process enables the user to retain separate logical parts within the same model while provides the ability to monitor and easily update the imported Rhino models in ARCHICAD. The LCF option also enables ARCHICAD's performance optimization algorithm to work seamlessly on an imported large Rhino model. Rhinoceros® 5, developed by Robert McNeel & Associates, is the market leader in industrial design modeling software. Highly complicated shapes can be directly modeled or acquired through 3D digitizers. With its powerful NURBS based engine Rhino 5 can create, edit, analyze, and translate curves, surfaces, and solids. There are no limits on complexity, degree, or size. One of the world's largest architectural design firms with over 2,400 professional staff, Nikken Sekkei and its eight Group companies offer comprehensive design, engineering, management, consulting and R&D services. Established in 1900, the company's portfolio consists of over 20,000 projects in 40 countries. Its activities cover a wide spectrum of sustainable public and private endeavors including new city design, high-density/mixed-use transit-oriented developments, super high-rise buildings, business parks, offices and facilities for commercial, cultural, educational and healthcare use. Nikken Sekkei is headquartered in Tokyo and maintains branch offices in Singapore, China, Korea, Vietnam, and the UAE. In growing to its present position, the company has constantly focused on the development of new methods and technologies that redefine design for current needs and priorities. GRAPHISOFT® ignited the BIM revolution in 1984 with ArchiCAD®, the industry-first BIM software for architects. GRAPHISOFT continues to lead the industry with innovative solutions such as its revolutionary BIMcloud®, the world’s first real-time BIM collaboration environment, EcoDesigner™, the world’s first fully BIM-integrated “GREEN” design solution and BIMx®, the world’s leading mobile app for BIM visualization. GRAPHISOFT has been a part of the Nemetschek Group since its acquisition in 2007. Visit archicad.com to see the most important milestones in ArchiCAD's 30-year history.